Intellectual Property (IP) is one of the most important assets that a professional service firm can build. Firms with structured, developed IP are, quite simply, worth more. With a Method Grid platform in place you enable the incremental growth of your IP capital as an everyday, whole-firm endeavour. At Gate One, we combine the advisory and delivery skills of our talented consultants with hard-fought transformation know-how to deliver lasting change that counts. A key differentiator is how well we capture, distil and enact the lessons of the past for the benefit of our clients. In the area of IP, I see Method Grid as a game-changer. It provides us with a step change in the value we can add for our clients and it is also a differentiator in the sales process. One of the biggest challenges of team-based delivery is ensuring that all your team members are working to a common standard. Building a reputation for excellence involves, first and foremost, delivering services to a consistent quality. Method Grid provides this easy-to-use, continuously-improving, centralised point of reference. Not only do clients get a real clarity as to the Provelio way and what they can expect to receive from us … our captured capital project method also provides delivery clarity to my team … so there is a real consistency to that delivery promise. To enhance productivity, firms need to work smarter. The increase in remote working has led to an increase in the need for on-demand information. 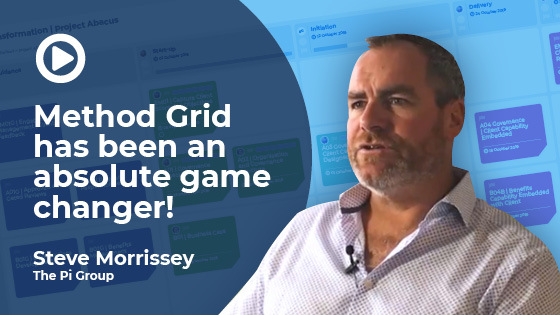 That’s where Method Grid comes in; providing a central place for firms to build, share and continuously-improve their operating playbook in a collaborative environment, available anytime, anywhere. Method Grid is not just your home for repeatable best-practice; it also enables your team to track their way through engagement delivery - step-by-step - with easy-to-use checklists. Via graphical progress drill downs, managers can easily track and support such delivery progress across the organization. Method Grid has been designed not just as a solution for building methodology but also for facilitating best-practice knowledge-management in your organization. With expert-tagging, a user can quickly locate colleagues best placed to answer any related queries they have. I research and teach the entrepreneurial journey, from initial idea to viable venture. Having been involved in the early beta testing of Method Grid, I can see its value both as an innovative, creative tool to help firms scale but also as a unique platform for an academic faculty. I am now using it to capture all of our disparate knowledge and educational resources in a single, structured location to help design and deliver learning experiences. I am also excited to see how it can be used as a powerful knowledge sharing tool - joining up collaborators across organizations. My next project! High-performing organizations are consistently excellent at the first-impression process of on-boarding - be that new staff or new clients. Method Grid expedites the time it takes for new colleagues to become revenue generating - and - supports their continuous professional development in your firm's unique way of working. 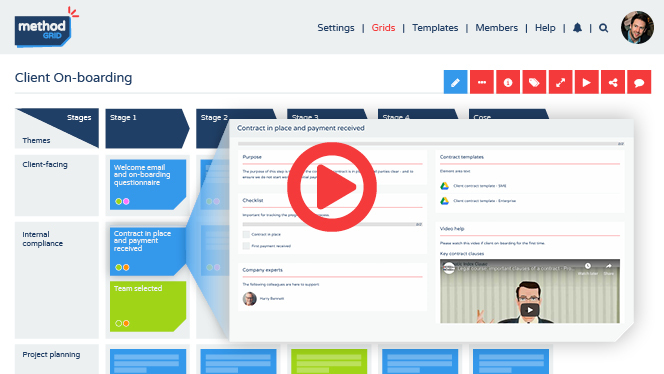 Method Grid enables a professionally-consistent client on-boarding journey.